Sarthi E Rickshaw is one of the trusted e rickshaw manufacturers. They are approved by ICAT. Saarthi E Rickshaws have been manufactured by best quality material using sophisticated technology. 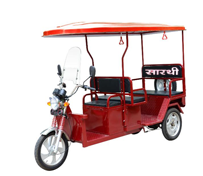 Saarthi E rickshaw are know for their durability and hassle free performance. They are in huge demand across globe. Here we are providing you all the technical specification, warranty charts and other information for the Saarthi. Controller - 24 Tube 50 Amp.